"There is an almost tangible sense of solidarity among these three, and the perpetual forward thrust of the music—ever swinging, ever groovy—conveys this shared purpose and their flawless intercommunication... An outstanding album and hopefully the first of many from this outfit. " A quick look at the songwriting credits should give some idea what Tri-Fi is about: balance, unity. Fries has penned four tracks, and Hall and Palombi wrote three each. These are spaced accordingly throughout the disc, not divvied up into uniform sections to suggest that one musician/composer should take precedence over another, or that any member of this trio prefers to think of himself in any context other than this one. And it follows, then, that the performances are equally balanced and unified. There is an almost tangible sense of solidarity among these three, and the perpetual forward thrust of the music—ever swinging, ever groovy—conveys this shared purpose and their flawless intercommunication. “Cross Country” is a relaxed groover, appealingly pop-ish in its way, with some colorful rises and falls in both tension and melody. Palombi takes a great solo, deftly supported by Fries, who sprinkles the perfect supplementing notes when the bassist takes a somewhat unexpected direction. Hall uses his turn to develop a kind of crescendo and release—it isn’t meant to dazzle, rather to introduce a new and necessary propulsive quality into the song. Palombi’s “My Family” is sweet, wistful, again made great by the trio’s smooth interplay. The bassist takes another fine solo here, and the similarities—the lyricism, the flow so natural it seems universally preordained—between his playing and that of Scott LaFaro couldn’t be clearer. Therefore it’s no great surprise to know that Palombi has transcribed LaFaro’s solos from his most famous recordings with the Bill Evans Trio, or that “LaFaro” would be the title of the sixth track, an intricate four-minute homage. In a twist on the hidden tracks that were all the rage a few years ago, Tri-Fi offers instead an online bonus track that can be downloaded in MP3 or AAC using the code inside the CD jacket. 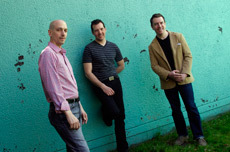 It’s a sassy, swinging version of Bernice Petkere’s “Lullaby of the Leaves,” and a tempting incentive to browse the trio’s website after buying Tri-Fi—an outstanding album, and hopefully the first of many from this outfit.